Needless to say, bankruptcy cases involve loads of data entry - creditors, income, property - and the list goes on. When preparing the petition, you spend hours of valuable time gathering client information and documents, in addition to inputting all of that data into your software. Collecting and entering all of this client data can be both time consuming and frustrating for legal professionals. NextChapter innovates the entire bankruptcy filing process, including client intake. 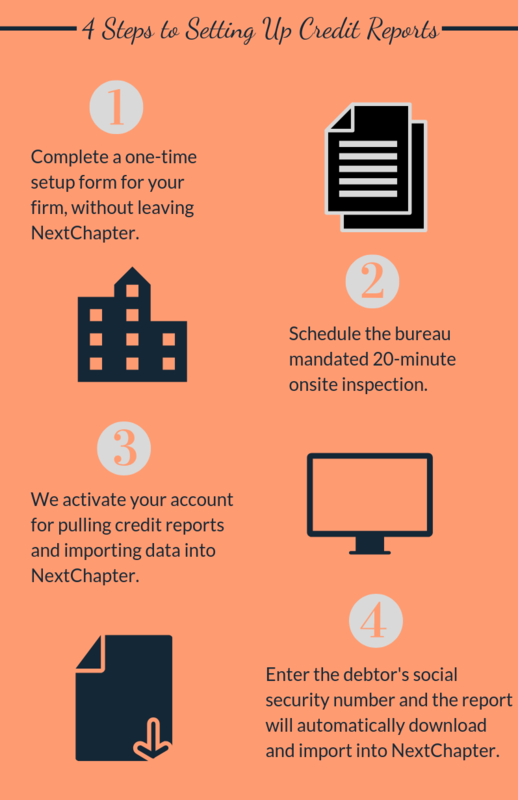 Our Credit Report Integration, which allows you to pull a debtor's credit report right through NextChapter, is one of the ways we're changing the way attorneys prepare BK cases. NextChapter is partnered with Universal Credit Services, an established credit reporting agency with over 20 years of experience, to provide reports to attorneys and their clients. These comprehensive reports, with data from all three bureaus (Experian, Equifax, and Transunion), are readily available to you. After completing the set up form in the NextChapter account settings and bureau-mandated inspection, pulling credit reports takes one step - entering in the debtor's social security number. Once the report is generated a printable PDF is available for your clients and all relevant data will be automatically imported into NextChapter. Why use NextChapter to pull credit reports when I can send my client to get one for free? Your clients have confidence in you to keep their sensitive data safe. With NextChapter and UCS, you can better gaurd debtors' secure data. We take security very seriously by implementing 256-encryptions, vulnerability scans, and physical data storage. Our partnership with UCS gives you and your client peace of mind. Say goodbye to off-the-path credit reporting websites and stick with a company you can trust. Many bankruptcy firms instruct their clients to pull their credit report from one of the many free reporting websites. Sending your client to the web seems like an easy (not to mention, cost-saving) solution. However, doing so often results in confused clients and delays. Bankruptcy clients are sometimes unaware of the proper credit reporting channels, which can lead to fradulaent internet scheme. And even if you provide your client with detailed instructions, the turnaround time is lengthy. By pulling credit reports through NextChapter, the responsibility of obtaining the data is entirely in your hands, so you can get started on preparing the petition sooner. In fact, firms that pull credit reports through NextChapter save an hour on average when preparing bankruptcy cases. Imagine what you could do with that hour you saved! In conclusion, all the benefits above boil down to one important aspect - saving your firm time. As many great business and political leaders have said, "Time is your most valuable asset." With our credit reports, you're making the most of it by eliminating time-wasted on data input. Contact a member of our sales team for more info at sales@nextchapterbk or by calling 888-861-7122 to learn more!